I have developed web service that can parse XML payload using JAXB framework. 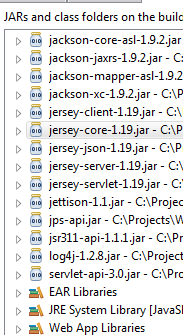 Now I need to extend this web service to parse the same payload in JSON format. The below logic that works for XML payload doesn't work for JSON payload. Appreciate your inputs. There is no grouplist available in the JSON data that you send that's why grpList.getGroupsList() returns null. From the POJO definition of LinkUserToGroup, the key groups should be a JSON array. Please try with the following JSON data.